If you’re looking for a premium laptop, you should check out the HP ENVY line of personal computers. The first thing you’ll notice is these are beautiful machines as the design is truly impressive. The laptops also have aggressive styling with a brushed aluminum cover, soft-touch surfaces, and a red backlit keyboard. The metal construction gives these laptops a high-end feel you won’t find from most PC laptops. We checked out the HP ENVY 14 Beats Edition. 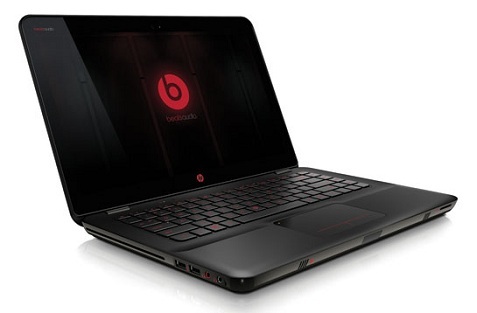 This notebook is built to deliver great sound with Beats Audio™. HP partnered with Dr. Dre to create a superior audio system featuring a redesigned headphone jack to reduce ground noise, a discrete amplifier for more power, a dedicated audio Island to minimize fan noise interference and a Function + B to engage Beats Audio. The difference in sound quality is noticeable with premium headphones and speakers, and the aluminum analog volume dial is a unique touch. I liked the dark design of the ENVY 14 Beats Edition, but you can also check out the lighter aluminum color of the ENVY 15 and 17, both of which also feature more rounded edges as the design evolves. I also liked the HP Radiance Backlit keyboard which features individual LEDs dedicated to each keycap. The keyboard also works with an advanced proximity sensor to illuminate when it detects a user approaching the notebook and deactivate after the user leaves. It’s these small details that make this machine impressive. Other features include HP CoolSense technology, which automatically adjusts performance and internal fan settings for a noticeably cooler PC. I was impressed with the large HP ImagePad which provides precise multifinger touch navigation. You can use swiping gestures with two or four fingers for easy navigation and control. The ENVYs are powered with the Intel® Core™ i5 processor2 with Turbo Boost Technology6. Check out the site for all the tech specs and you can find the machine that works best for your needs. In a crowded PC world, it’s important to see manufacturers produce computers with some style and soul. The new ENVYs from HP definitely fit the bill and should be on your test list if you’re looking for something more than the standard laptops in the market today.